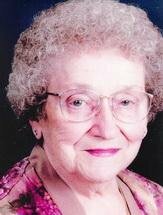 WATERLOO - Mabel Rose Anderson, 82, of Waterloo, died Friday, April 23, at Allen Hospital after a short illness. She was born Feb. 10, 1928, on the family farm in Mount Vernon Township, daughter of Philip and Anna Hartung Walther. She married James Kenneth Anderson on June 16, 1946, at St. Paul's Evangelical Church, Mount Vernon Township. Mrs. Anderson was employed by the Waterloo Schools and retired as manager of the East High Cafeteria. Survived by: her husband, James; three sons, Gene (Sandi) of Cedar Falls, Wayne (Jana) of Lancaster, Calif., and Allen (Deb) of Boulder, Colo.; six grandchildren, Bryan (Renae), Vaughn (Sonya), Scott (Angie), Dawn, Krista (Jason) Radikie and Kim; and six great-grandchildren. Preceded in death by: five brothers, Fred, Alvin, Williard, Raymond and Donald Walther; and a sister, Leota Weber. Services: 10 a.m. Wednesday at Immanuel Lutheran Church, Waterloo, with burial in Garden of Memories Cemetery. Public visitation from 4 to 6 p.m. Tuesday at Garden View and for an hour before services Wednesday at the church.